Is it true? Is it good? Is it useful? Next time you feel the need to speak about anyone, ask yourself first; Is it true? Is it Good? Is it useful? 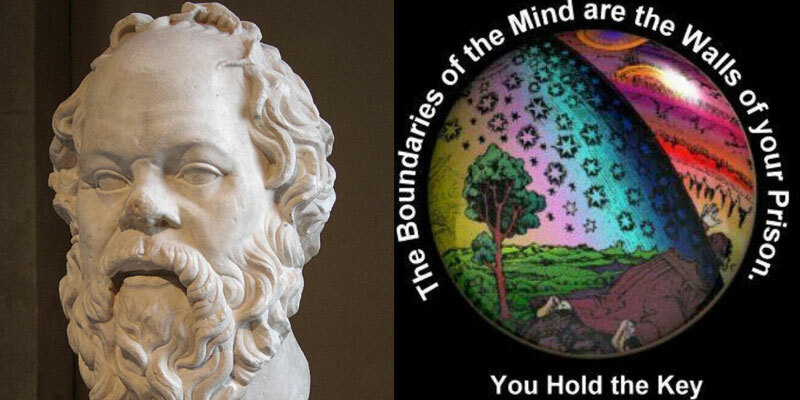 While the Socratic Dialectic is not the progenitor of Integral Deep Listening, comparisons and contrasts help to clarify IDL while helping us to remember, respect and use the outstanding tools that Socrates developed and gave to the world so long ago. Who was Socrates? One of the founders of Western philosophy, Socrates lived in Athens, Greece in the 5th century before Jesus, making him a later contemporary of Gautama Buddha in India, and of Laozi and Confucius in China. He was the teacher of Plato, who was in turn the teacher of Aristotle, who was himself tutor to Alexander the Great. What we know of Socrates comes primarily from the dialogues of his student, Plato, and it is here that we learn of his procedure for questioning the assumptions of others in a structured process that has been called the “Socratic Method,” the “Socratic Dialectic,” or elenchus. What is the Socratic Method? In the Socratic method, problems are broken down into a series of questions. Consequently, the Socratic dialectic is, like Integral Deep Listening (IDL), essentially an interviewing modality. How does it compare to IDL? While Socrates applied his method to questions of ethics, morality, and social justice Integral Deep Listening interviewing addresses whatever life issues a student names and whatever subjects an interviewed emerging potential finds worth mentioning. The questioning format of IDL is much more structured than that of the Socratic Dialog and consists of a protocol that provides direction. It includes self-ratings by the interviewed character of six core qualities, most of which Socrates would recognize as virtues. What are the purposes of the Socratic Dialectic? It is designed to reveal the underlying beliefs and assumptions that a person holds as well as the extent of their knowledge. In the Socratic method people are confronted with the contradictions within their own thinking, leaving their beliefs and the emotional preferences which they represent, undefended. How is the Socratic method used today? The influence of this approach is most widely observed today in the forming of hypotheses within the scientific method as a negative process of hypothesis elimination. By identifying and eliminating poor or faulty explanations that are not rational, in that they contain contradictions, only strong hypotheses remain. Are there limitations or problematic aspects to the Socratic Dialectic? The consequence of confronting people with the logical inconsistencies of their beliefs is that they can feel attacked and vulnerable. They may get defensive and then counter-attack, generally in ways that are irrational, such as with ad hominem attacks on the questioner, attempting to change the subject, or by coming up with excuses and rationalizations rather than reasons for their position. While this makes them even more wrong, it does not make them any more willing to be reasonable or to learn from someone who makes them feel inadequate. That Socrates never seemed to recognize this clear and fundamental fact about human nature tells us that while he may have been an excellent philosopher, intellectual, and opponent in rhetoric, he was no psychologist. It is no wonder that Socrates alienated the power structure of Athens, because his method made them look stupid and ignorant while causing them to feel attacked and vulnerable. At one point in his life Socrates had been a soldier and was noted for his bravery in combat. To those on the receiving end of his dialectic, they could easily feel under assault from a form of intellectual warfare. In truth, they were. What were the origins of Socrates’ use of his dialectic? According to Plato’s Apology, Socrates’ life as the gadfly (horsefly) or “perpetual irritant” of Athens began when his friend Chaerephon asked the oracle at Delphi if anyone were wiser than Socrates; the Oracle responded that no-one was wiser. Socrates believed the Oracle’s response was a paradox, since he thought he possessed no wisdom whatsoever. But clearly Socrates had to know he was intelligent, smart, and in addition, wise, to draw that conclusion in the first place. Was Socrates being coy or provocative? Socrates decided to test the Oracle’s contradictory pronouncement by approaching the statesmen, poets, and artisans of Athens in an attempt to refute the Oracle’s pronouncement. Was he as smart as the oracle claimed? Socrates’ paradoxical wisdom made the prominent Athenians he publicly questioned look foolish, turning them against him and leading to accusations of wrongdoing. Socrates defended his role as a gadfly until the end: at his trial, when Socrates was asked to propose his own punishment, he suggested a wage paid by the government and free dinners for the rest of his life instead, to finance the time he spent as Athens’ benefactor. Is there a parallel to this “irritant” component of Socrates’ dialectic in IDL interviewing? This “gadfly” component of Socrates’ dialectic shows up in Integral Deep Listening when a person is light-heartedly invited to tell a dream, only to then find that they have opened something of a Pandora’s Box. They may be shocked, embarrassed or overwhelmed by how an innocent game suddenly becomes profoundly relevant. This parallel comes up again when Practitioners of IDL have students commit to identifying and working daily with applying recommendations from their interviews in their daily life, and then badgering them for reports on their progress. IDL justifies this badgering by first asking for and receiving permission for such badgering and by contending that most of us have a love-hate relationship with accountability. There is little doubt that we do better when we set goals, commit to them, and have some accountability structure to keep us focused in our pursuit of them. What did Socrates’ method reveal about self-knowledge? Socrates was apparently notorious for asking questions but not answering, claiming to lack wisdom concerning the subjects about which he questioned others. This was stated as, “I know that I know nothing” or “I know one thing: that I know nothing.” When Socrates questioned the wisest men in Athens he concluded that while each of these public figures thought he knew a great deal and was wise, in fact, when their assumptions were questioned, he discovered that they knew very little and were not wise at all. Socrates realized the Oracle was correct; while so-called wise men thought themselves wise and yet were not, he himself knew he was not wise at all, which, paradoxically, made him the wiser one since he was the only person aware of his own ignorance. What are historical strengths and weaknesses of Socrates’ legacy? However, while Socrates was wise enough to stick to his principles, with the consequence that he won the respect of his student Plato, who made a lasting place in history for himself as not only a philosopher but as a martyr for truth, it seems he was not wise enough to keep from alienating exactly those who held the keys to a greater, lasting influence on Athenians. While Socrates may have ensured his place in history through inspiring his student Plato, his heroic efforts did nothing to stop the rapid decline of Athens as a city state, and with it, bury the prospects of democracy for almost two thousand years. Are there ways the “paradoxical wisdom” of the Socratic method appears in IDL? It takes the trivial, like spit or the stripes in a dream road, seriously; it purposely refuses to differentiate between dreaming and waking realities; makes fun of the serious, evil, and holy; takes seriously the stupid and foolish; ignores death; encourages dissociation; refuses to interpret yet respects the interpretations of clouds and bugs; listens to personifications of pain, disease and trauma; defers to the authority of imaginary dream characters and other self-created fantasies; purposefully confuses truth and falsity; encourages ambiguity; supports moral relativity within a clear hierarchy of growth and values; and finds virtue in the questioning of all virtues. IDL does not do these things in a celebration of perversity or as some sort of statement of intellectual superiority, as the Socratic method sometimes appears to do. These paradoxes are natural products of the method. If you practice IDL you will be thrown head first into a trans-rational art form that is sometimes called “crazy wisdom.” Like Socrates’ claim that the Good lies on the other side of reason, so IDL finds that a broader, richer experience of life lies on the other side of belief and most forms of rationality. How does IDL differ from the Socratic Dialectic? While IDL shares with the Socratic Method a desire to clarify through questioning, confronts ambiguity and contradictions, and seeks deeper understandings of truth, it differs from it in other significant ways. Socrates’ dialectic is directed toward understanding, clarifying, and improving both the reasoning and the assumptions of the interviewed. Although Socrates apparently denied it, this is essentially a teaching function. IDL interviewing directs similar intentions (confronting ambiguity and contradictions while seeking a deeper understanding of truth through questioning) not toward the subject but toward the perspective of a particular role that they take on. It does not question in order to do reveal underlying beliefs or the extent of the knowledge of the person being interviewed. This is because IDL interviews are not designed to question an individual, as the questions of the Socratic dialectic are. The intention of IDL is not to disclose their beliefs or the extent of their knowledge. Instead, it is directed to the disclosure not only of the beliefs and knowledge of a particular interviewed perspective, but to amplify both its perspective and consciousness in the awareness of the person who is being questioned. The importance of this difference from the Socratic dialectic is that while it attempts to clarify the beliefs and extent of knowledge of the individual, IDL assumes that the subject is stuck in ignorance for good reason and will not take cajoling and confrontation well. While it is highly unlikely that Socrates was familiar with the concept of resistance, that is, the natural defensiveness that people express to being attacked, there is abundant evidence that he had first hand experience with its effects. Confronting the interviewed with the inconsistencies in their beliefs and the limitations of their knowledge is more likely to generate resistance than growth. If truth is the object, resistance is a sign truth is present; if growth is the object, resistance is a sign things are going too fast. IDL views resistance itself as a wake-up call to be interviewed. Consequently, because IDL makes a conscious choice to value growth over truth, it prefers to interview and amplify co-existing perspectives that are not stuck in identification with those beliefs and perspectives which limit the growth of the subject. Are interviewed emerging perspectives self aspects? Those who would argue that interviewing emerging potentials is indeed a disclosure of the beliefs and the knowledge of the individual who has adopted that perspective, need to listen to the reports of the interviewed elements themselves. According to most interviewed emerging potentials, while they indeed personify this or that characteristic or attribute of the individual, their perspective is significantly autonomous, existing independently of the issues, priorities, beliefs, and perspectives with which the individual identifies. Their ontological value is neither wholly internal to the individual, nor is it external; it is emerging. These perspectives express emergent realities. They are not bubbling out of some unconscious. They do preexist in some metaphysical unconscious, preconscious, or subconscious latent state, waiting to be “uncovered.” The importance of this difference from common assumptions of psychology is that it honors such perspectives for themselves, as a phenomenological statement of respect, without making their existence contingent on someone or something else. Is there a price to pay for pointing out to people that they are irrational? If you use the Socratic method you will be rational and “right,” and you may be respected for waging intellectual warfare and winning. If you are clever, people will be forced to recognize how smart you are. However, rightness and Truth exist at one end of a scale. At the other end exist empathy and Love. Those who turn rightness and Truth into gods tend to view those at the other extreme as obsequious hypocrites lacking backbones, eager to please others by telling whomever they face whatever they want to hear. They themselves, however, are generally viewed by those at the empathetic and loving end of the scale as pedantic narcissists who lack empathy and compassion. When Socrates is on trial for heresy and corrupting the minds of the youth of Athens, he uses his method of elenchos to demonstrate to the jurors that their moral values are wrong-headed. He tells them they are concerned with their families, careers, and political responsibilities when they ought to be worried about the “welfare of their souls.” This may have been right and true, but was it loving and compassionate? Socrates would argue that it was, because the way to the Good is through reason. Is Socrates’ approach the best for most people? IDL agrees with Karl Popper and Pierre Hadot that Socrates was attempting to get those he was questioning to grasp a concept of goodness that transcends everyday experience. However, IDL does not believe that Socrates’ Dialectic is the most effective method for most people, because it is challenging, confrontational, and aggressive, and therefore likely to elicit defensive and avoidant reactions, as indeed it did in Socrates’ audience. For IDL, the challenge is to develop and use a methodology that finds balance between these two extremes. Socrates defines that which is good and loving as only that which can withstand the rigors of rational filtering. If it doesn’t make sense, it can’t be good, even if it feels good and we are personally convinced that it is good. Integral tends to agree with Socrates on this. It does so when it states that transpersonal development is trans-rational development. That is, access to the Good presumes fore-knowledge of reason, logic, and the ability to think things through. If a person cannot, has not, or will not do reason, then they may be loving, kind, compassionate, talented, psychic and empathetic, but these characteristics exist in the prepersonal, pre-rational context of belief and faith. Although prerational love is real and good, it is not founded on reason, and therefore for Socrates, is not a love that transcends reason, although the experiencer always is sure that it does. This is because they do not differentiate between belief, belief and reason, and experience that transcends and includes both belief and reason. Are Truth, Goodness and Harmony universal absolutes? IDL disagrees with Socrates on this. IDL does not define truth, rightness, harmony, love, and the Good as absolutes, as Socrates does, but as emerging potentials that exist at every stage of development in healthy and unhealthy forms. The object is to amplify the healthy forms of both truth and love at whatever stage of development we presently inhabit instead of taking on the Sisyphean task of requiring the intellectual clarity necessary to grasp ultimate, supreme, trans-rational Goodness and Truth. IDL teaches such acceptance as one of its six core qualities or virtues to be amplified and balanced by everyone, regardless of their ability to reason. Is the pursuit of ethical virtue the reason for life? Another purpose of Socrates’ method was to disclose core virtues, such as the idea of the Good. He believed the pursuit of ethical virtue was the reason and justification for life and that his method was a means to that end. Similarly, IDL uses its interviewing process to disclose virtues in the form of six core qualities that are derived from six stages of the round of each breath (abdominal and chest inhalation, the pause after inhalation, chest and abdominal exhalation and the pause after exhalation). Unlike Socrates, it does not reduce these to one primary virtue, but instead emphasizes both the balancing of the six and the appropriate and timely use of each. Different interviewed emerging potentials personify perspectives that emphasize some of these virtues and de-emphasize others. Those who score very high in all six virtues are often difficult to assimilate and integrate into waking life, due to the innate elevationism and idealism of their perspective. What are other important differences? IDL interviewing is not a process of logical cause and effect the way Socratic reasoning is. One question is not designed to eliminate or rule out certain possibilities so that the field of questioning is narrowed. Instead, the IDL interviewing format emphasizes first role identification and then offers invitations to both self-explanation and transformation. Self-explanations by an interviewed character are routinely confronted and challenged by the interviewer, but neither in the way or for the same purposes as in Socratic questioning. Choices not to transform are as important, useful, and valid as choices to transform, since they may indicate the importance of a certain perspective that needs to be heard, respected, and implemented. The final emphasis of IDL interviewing is a pragmatic one that focuses on operationally defining what has been heard and then setting up a method of self-monitoring and accountability so that measurable concrete benefit can be derived from the process for the individual. This makes IDL not only a yoga but a transpersonal yoga. All of this is elaborated in one of the texts of the IDL Practitioner training program, Integral Deep Listening Interviewing Techniques. Can IDL be used as a way to test the conclusions of the Socratic Dialectic? As noted above, part of the lasting legacy of the Socratic Dialectic is in winnowing out false assumptions in the formulation of hypotheses for empirical testing. IDL interviewing supports this process by subjecting a final hypothesis to the judgment of one or more high scoring emerging potentials. What this does is run the hypothesis through a filter that values the six core qualities, something that most empirical studies do not consider, but need to do. For example, the entire history of the development of atomic energy proceeded from the development of hypotheses that met Socrates’ test of rationality but had nothing to do with the Good. The Good was not consulted, because the scientists developing atomic energy, as most men, were sure that they represented the Good. Then there were also those who, like Werner Von Braun, were brilliant, but were more interested in achieving success in their area of expertise than in any abstract, overarching concept of the Good, which seems metaphysical in any case, and subjects reason and science to values that change with governments and cultural preferences. However, this is less true for interviews with emerging potentials. Although they are indeed partially conditioned by culture, they are found to be more evolved than both the subject and the culture in which he or she is embedded. This means that scientists who do interviews around their hypotheses are likely to access perspectives that cast their efforts in the evolutionary arc of self, ethical, and empathetic lines. The result is that the natural grounding in the objective quadrants of behavior and systems is balanced by a grounding in the quadrants of culture and consciousness. The result is more likely to be hypotheses that are integral and reflect deep listening instead of being partial and short-sighted, producing problematic, if not outright devastating results. How can students of IDL benefit from familiarity with Socrates’ dialectic? Students of IDL can learn from Socrates his respect for logic. Irrationality and faulty reasoning is one of three forms of cognitive distortion. The other two involve emotional cognitive distortions and perceptual distortions, which I have written about in Waking Up. Socrates was a master at understanding and using the second type of cognitive distortion, irrationality, and its antidote, logic, something that most people ignore or dismiss. Learning to recognize, avoid, and confront logical fallacies will teach you how to reason, which is a pre-requisite to evolution into any permanent transpersonal, trans-rational level of development.